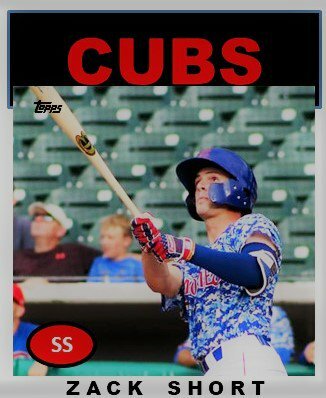 This year’s baseball card collection concludes with the “Cards of the Off Season.” It’s a mixed bag of action and prospects. Beginning in October, I began finding the occasional picture on Twitter, Instagram, Facebook, or the assorted local newspaper. Most of the collection comes from the Arizona Fall League and Myrtle Beach’s Twitter account. To see the 110+ cards, click here. Selecting 10 cards for this post was not exactly easy. There was not an overarching theme for inclusion, either. So, I just picked the 10 cards I liked the most. 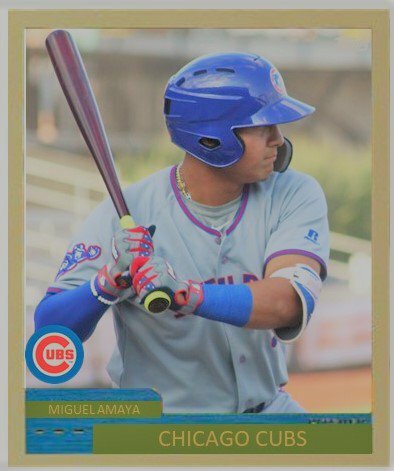 I snapped this shot of Miguel Amaya back in July in Davenport. I was in the camera well with the video guy and it was a series of shots I wasn’t sure I could get because the back of the stadium stole all the light. Coming in at number 10 is Christian Donahue in a Pelicans’ specialty jersey. The Pelicans basically wore Carolina Panthers’ jerseys. I just like the way the black pops in this picture by Larry Kave. At number nine, Rikk Carlson captures the intensity of Ryan Williams in one of his comeback/rehab starts last summer. 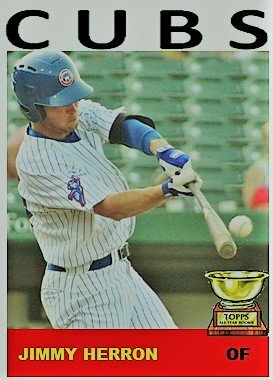 And at number eight, the Tennessee Smokies got a nice snapshot of Zack Short’s follow through. 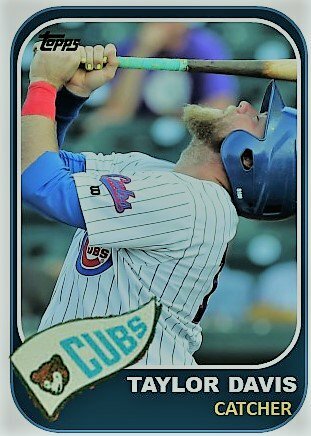 I just love the angle of the bat in the card. At number seven, Minor League Baseball produced this up close shot of Nico Hoerner in the Arizona Fall League. I like the way everything fits and really captures the focus that he has at the plate. At number six, Rikk Carlson appears again with the ball jumping off of Jimmy Herron’s bat. 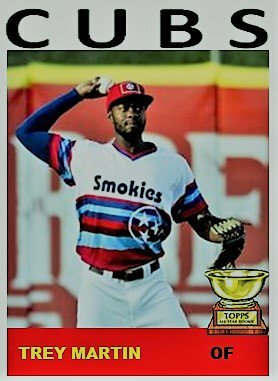 The Knoxville News Sentinel comes in at number five with a picture of Trey Martin in one of the Smokies’ specialty jerseys that are reminiscent of the 1970s Houston Astros. I need to get my hands on one of these along with that Tri-Star Tennessee hat. 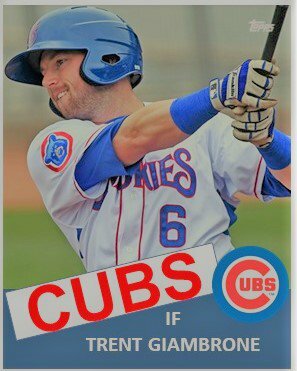 At number four, the Smokies come in with this up close pic of Trent Giambrone. 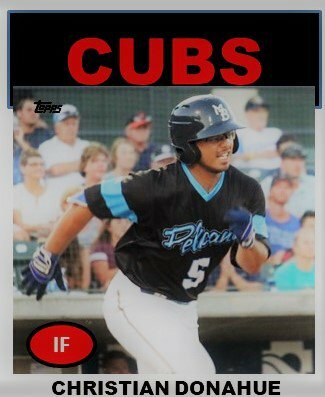 Minor League Baseball got up close and personal with Johnny Pereda in the Arizona Fall League. I just love how all the blues melt together in this picture. At number two, Dylan Heuer captures the anguish of Taylor Davis at the plate. 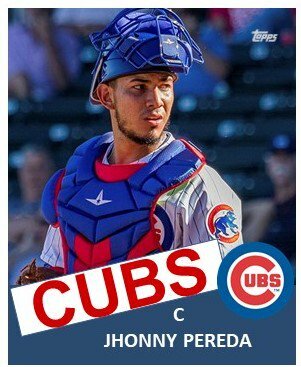 My favorite aspect of this card is the horizontal bat going across Davis’s helmet at the top of the card. 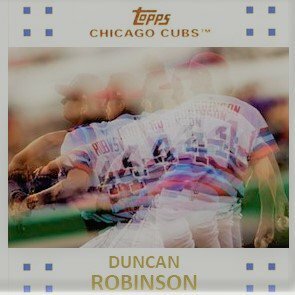 This is one of my favorite cards of the year, maybe of all time, as the Knoxville News Sentinel got some multiple exposures of Duncan Robinson. We don’t see too many “fancy“ pictures make it into the sports pages, newspapers, and or websites. So this is a pretty cool treat and a pretty cool card. P.S. I love the green at the bottom of the picture! Hi Todd. Great job covering Cubs prospects. 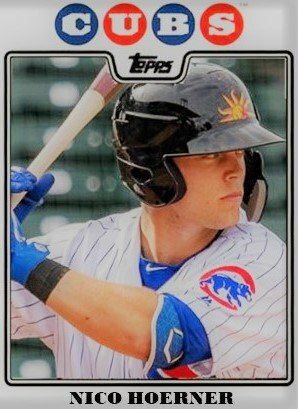 I watched every Mesa Solar Sox game again this year & there was one prospect that I don’t find much information about and I was really impressed with his stuff. Manuel Rondon had great outings & also had a couple of bad outings. When he lost it he really lost it. Any place you can point me to so I can find even more on this young man. I read most of the main Cubs analysts and National ones. I cant wait for my Baseball HQ, I would think he’d be in there this year. Thanks for the comment, Clyde! Rondon broke out in 2016 as a Cub in Eugene. Back then he was a starter who dominated the Northwest League. 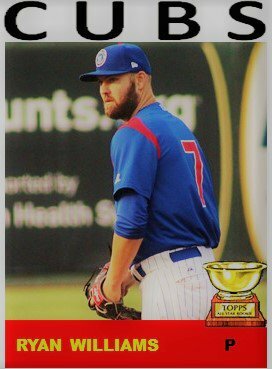 In 2017, he struggled at South Bend in a starting role before being sent to the pen. This year, coming off an injury, he shined in a relief role in Myrtle Beach in the second half before going to Arizona. It’s unclear if he is going to start or relieve, but relieving might be his ticket to get to the majors. Here are some posts I have mentioned him in.